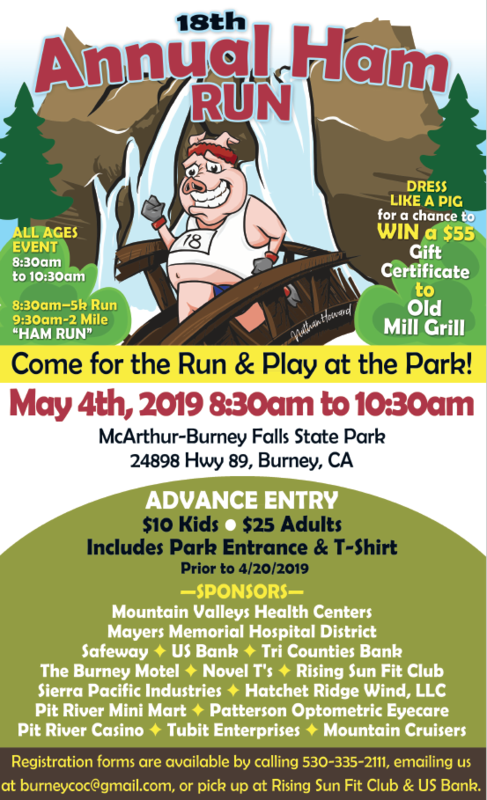 The Burney Chamber of Commerce invites everyone to the 18th annual Ham Run at the McArthur Burney Falls Memorial State Park on Saturday, May 4, 2019 between 8:30 a.m. and 10:30 a.m. This is a great family event in a spectacular setting. It includes a 2 Mile Run/Walk and 5K run through the park and onto the dirt trails. Registration forms available by calling 530-335-2111 or email burneycoc@gmail.com. You can also visit Rising Sun Fit Club or U.S Bank in Burney. Pre-registration (before Apr. 20) for this event provides FREE entry into the park for the whole day, so make sure to register early. T-Shirt also available for Pre-registration. We are fortunate in our supporters and staff indeed. 2018 was challenging for so many of our friends and neighbors with fires and smoke for most of the summer months. Our parks remain beautiful and safe and your support has allowed us to maintain the interpretive and educational activities that are a part of many visitors experience. The Visitor Center, open April through October, continues to be an inviting stop for many visitors to the park, more than 20,000 in 2018. The Center provides displays and hands-on activities about the geology, animal and plant life and cultural history of the area. 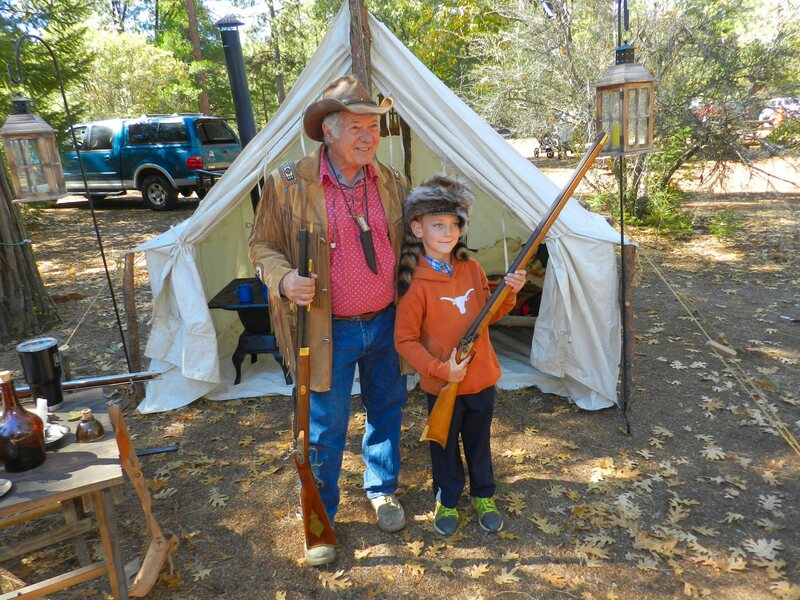 In addition, weather and daily interpretive activities are displayed and hard-working camp host volunteers help visitors plan their time in the Park. These hosts are knowledgeable about the park and, in many cases, have returned again and again. The Park’s Interpretive Association offers special thanks to Cheryl Fish, Dave and Gloria Peavy, Ed and Judy Adams, Mary Babin, Ozzie and Theda Neighbours, Randy and Kathy Van Noort, Rick and Carol Pate and Mike and Gwen Coleman. The Park experience would not be the same without these folks who love the park! Visits to the Park begin at the entrance kiosk with the annual Visitor Guide that provides park history, a park map and information about interpretive and program activities. 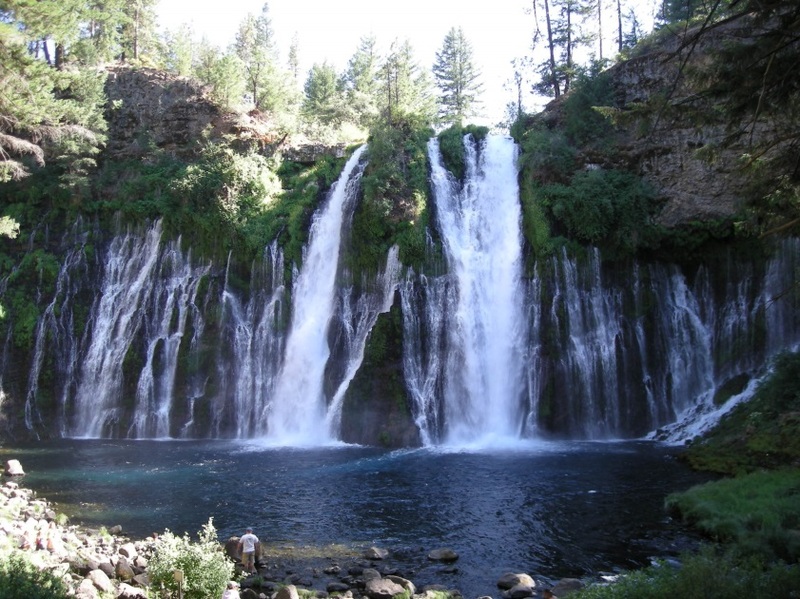 The Park Association, Friends of Burney Falls, funds the production of the newspaper. 26 canoe trips, funded by the Kelly’s Wishes Foundation and the Association, took nearly 300 visitors on tours of Lake Britton, with opportunities to see turtles, otters, eagles and other abundant bird species. 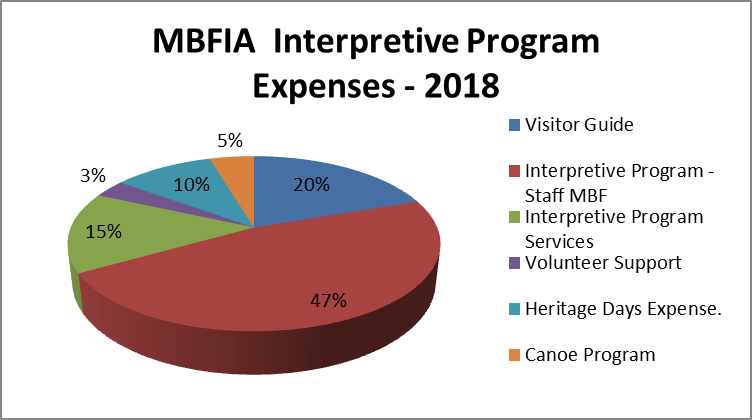 Thanks to the Foundation, we were able to add two new canoes this year, and hope that we can expand the number of these very popular guided trips. Bird walks are now a regular park activity, thanks to viewing telescopes and binoculars provided by The McConnell Foundation and Kelly’s Wishes Foundation. The local Wintu Audubon Society helped the Park update its bird list, and led a Society walk in the spring. They were just in time to see the arrival of the Black Swifts that nest in the falls, along with warblers, vireos, chickadees, woodpeckers, swallows and mergansers. The park was also hosting an active eagle nest and an osprey nest with two chicks during this late May walk. Organized bird walks served nearly 30 visitors; in addition, ten individuals checked out binoculars for their own exploration and additional visitors used the small bird and native plant library in the Visitor Center. The Park offers a self-guided Discovery Challenge program, printed in the Visitor Guide. Over 1500 visitors completed the challenge and were awarded the 2018 Discovery Challenge embroidered patch of Burney Falls. 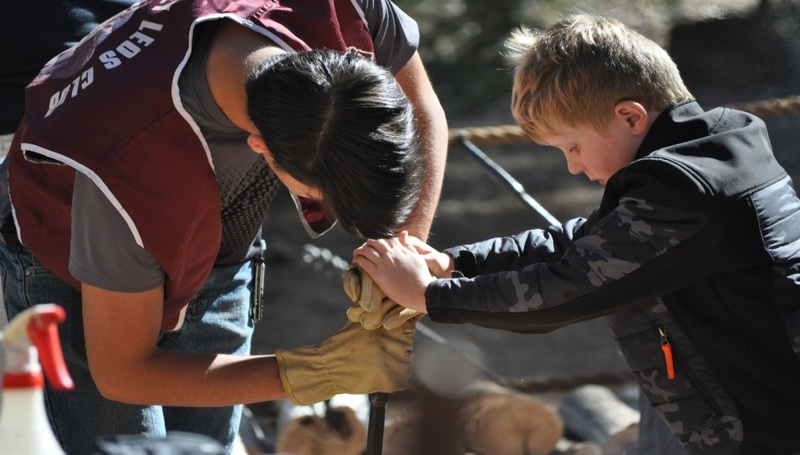 In addition, the formal Junior Ranger program offers the opportunity to participate in activities and crafts. 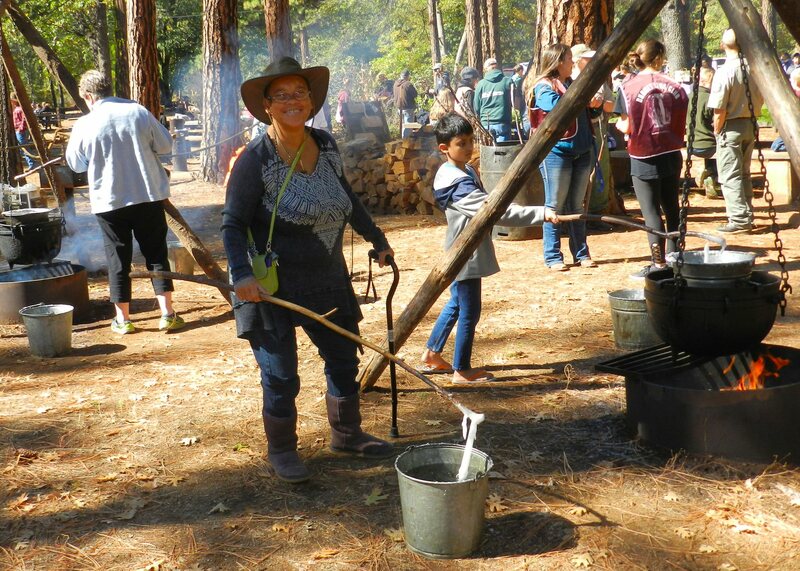 Regular interpretive activities include hikes, crafts, singalongs, interpretingo games and Dutch oven cooking demonstrations. 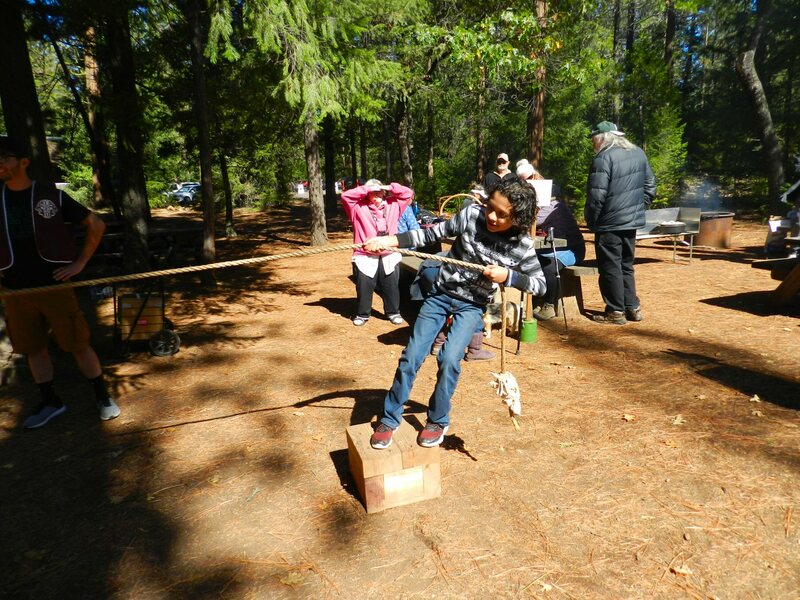 Campfire presentations are as much a part of camping here as marshmallows: 13 campfire evenings included four presentations by Shasta Wildlife Rescue & Rehabilitation, giving campers a chance to see and learn about live owls, hawks and eagles. This year, Camp Host Ed Adams created a new presentation, StarWatch, giving campers a tour of the heavens through telescopes. StarWatch was held on 5 nights in the summer, but despite its popularity, it was cancelled in August due to the smoke from nearby fires. Interpretive staff provided ten presentations to school groups who visited the Park during the year. Nearly 500 youngsters walked the trails, explored the plant and animal life, and learned some of the history of the area. 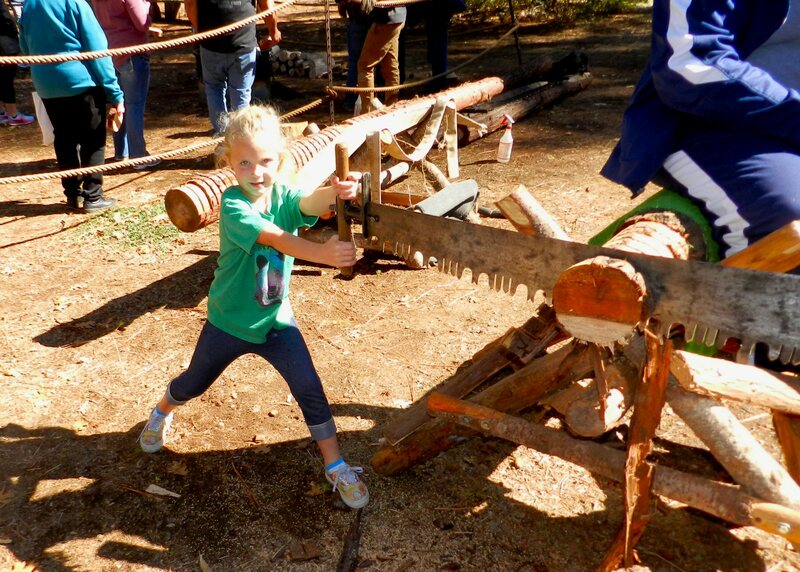 Nearly 1000 Park visitors enjoyed Heritage Day in October. This community event explores life in the 1870s in the Intermountain area. 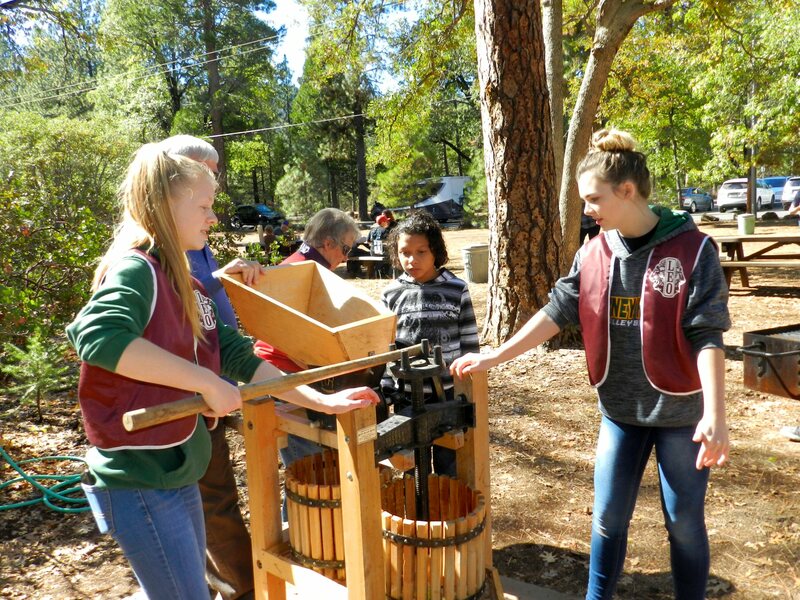 Local volunteers share their history and expertise with Mountain Man exhibits of tools and implements and opportunities to participate in candle-making, beading, weaving, pine-doll making, cross-cut sawing, branding wood discs, rope-making and target knife-throwing. 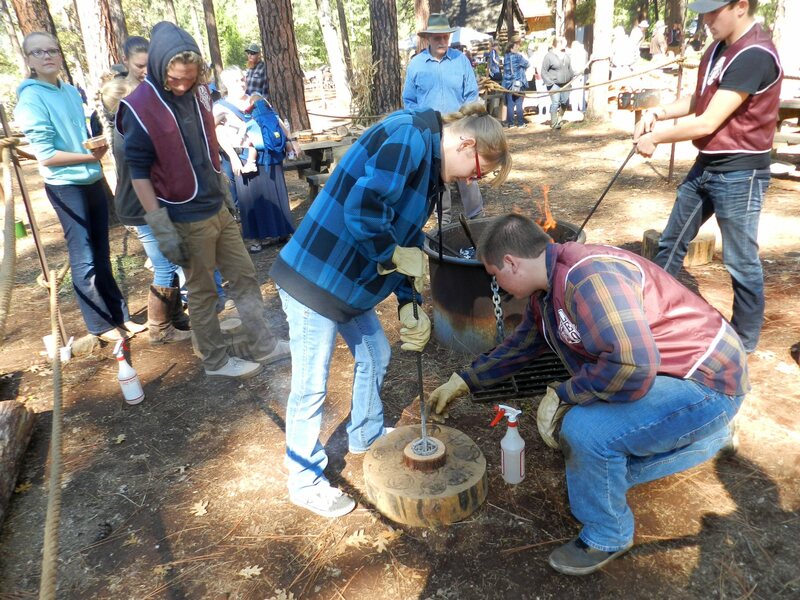 Attendees made fresh apple juice with a hand-cranked press and helped prepare Dutch oven apple crisp. 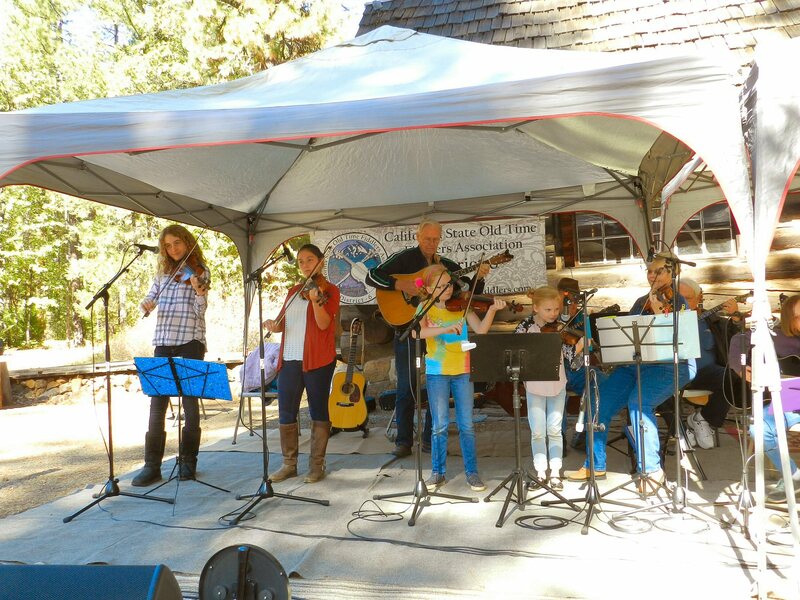 The day was enlivened with the music of Old Time Fiddlers and wagon rides with Wagon Ponies. In addition to the individuals who share their skills, the Burney Lions Club, Leos Youth Organization and Rotary Club of Burney-Fall River provided parking assistance, food sales and the staffing of numerous activity booths. Many community folks have been helping put this heritage-themed day on for more than 30 years. Castle Crags State Park suffered extensively from nearby wildfires this year, and was closed for many days due to smoke. In addition, park staff were called upon to assist in the fire suppression tasks, and Interstate 5 was closed for an extended period of time. Despite this shortened time, the Association provided a Visitor Guide to 8000 park visitors. 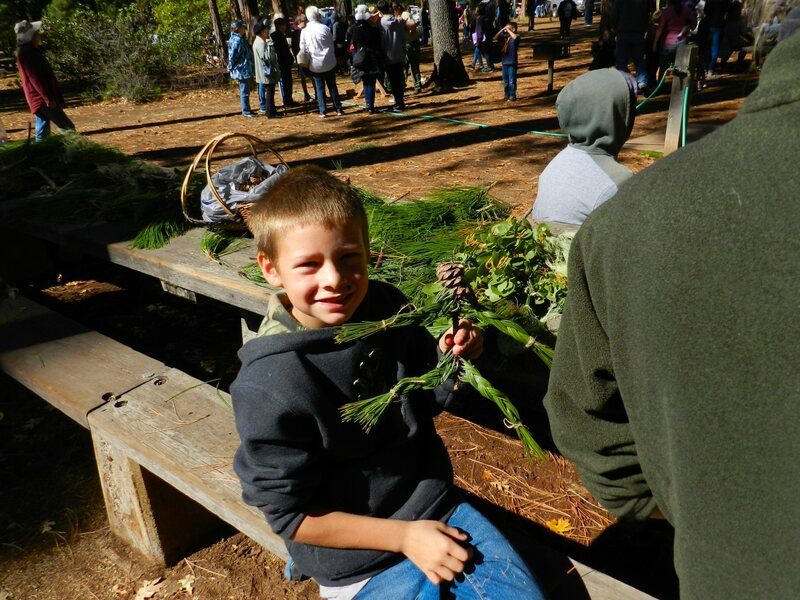 The Park provided 10 evening programs and awarded more than 250 Discovery Patches to campers and day visitors who completed the nature challenge. The remodeled gift store area provided visitors with opportunities to enrich their visit, and the funds from this activity, along with the sale of firewood and recycling, supported the educational and interpretive activities. More than 300,000 visits were logged in to www.BurneyFallsPark.org this year. The web site has continued to add content to support visitor experience in the Park. 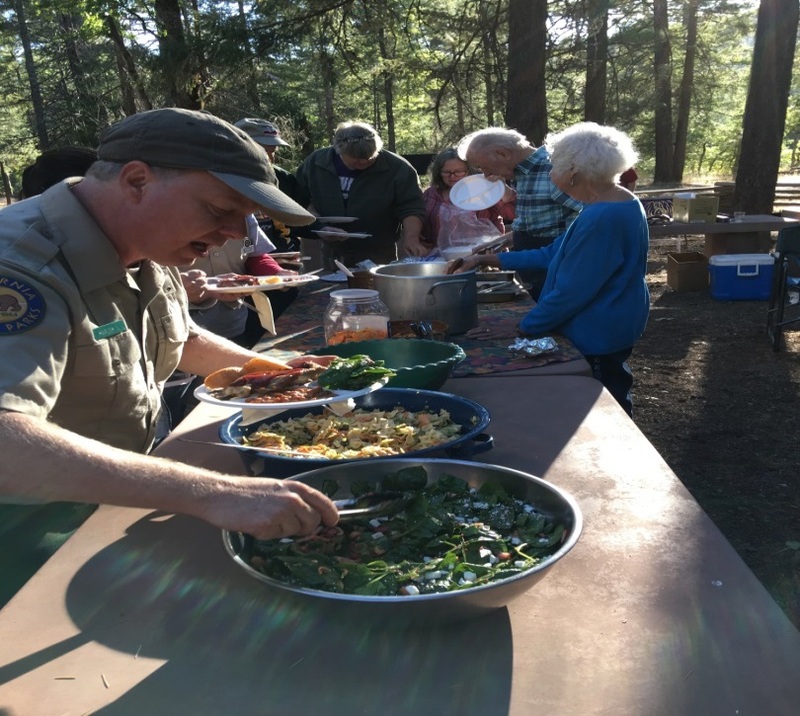 We also publish a periodic e-newsletter to keep our park friends up-to-date on the latest happenings at both Burney Falls and Castle Crags State Park. If you would like to receive the newsletter, please let us know at either web site above. In spite of the months of fires and smoke that reduced park visitation, we had a very good year. Gross revenues of $89,364 included generous donations from the Delong-Sweet and the Kelly’s Wishes Foundations. 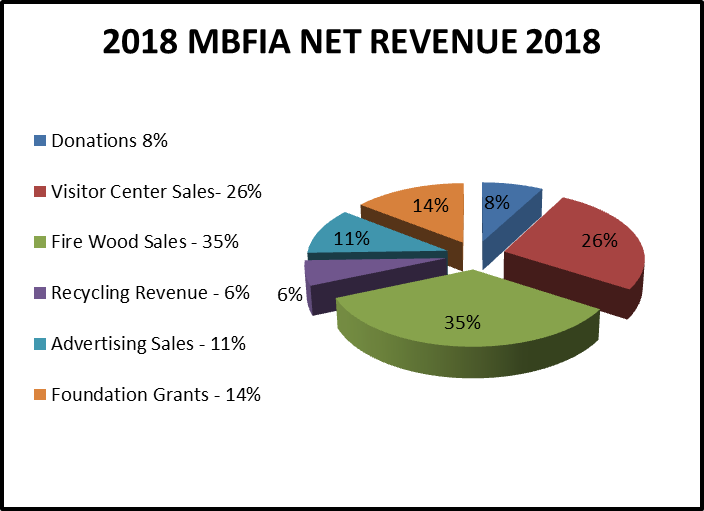 Firewood and Visitor Center Sales provided over half of the net revenue at 61% of funds earned, returning profits of 44% and 38% respectively. Recycling, advertisement sales, donations and foundation grants provided the other remainder revenue. This has been a challenging summer in this part of the world. The Park has not been directly affected by the fires, but they continue to burn all round us. The most damaging has been the Carr fire, burning near Redding. It has killed seven people, consumed more than 200,000 acres, destroyed 1600 buildings and has created an ecological wasteland that will have a catastrophic impact on the wildlife in the area for years to come. All of us connected to the Park know someone, or several someones, who have lost everything. 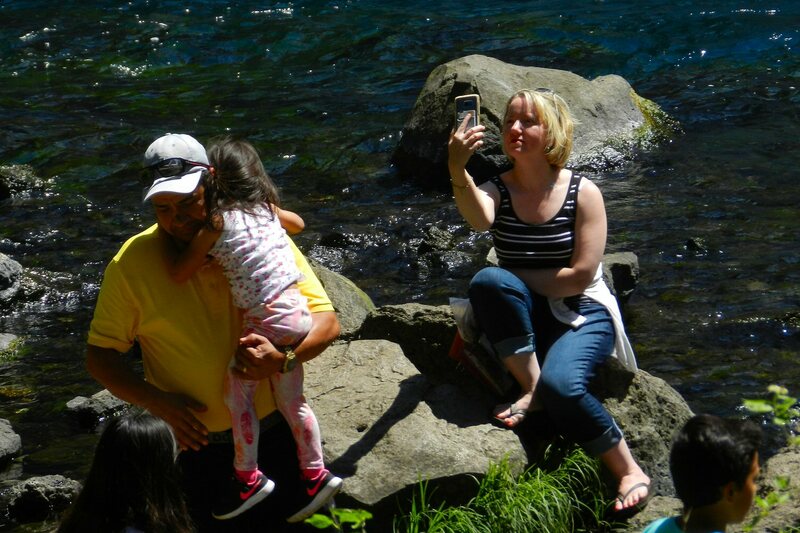 The biggest impact to most Burney Falls visitors is, of course, the smoke. There is another fire, the Hat fire, which burned to the east of the park near Fall River Mills. It burned nearly 2,000 acres. Its main impact was closure of Highway 299, which is now open, and yet more smoke. The Hirz fire on the McCloud arm of Shasta Lake continues to grow. Finally, a major piece of road work between Burney and the Highway 299/Highway 89 corner has caused significant traffic delays, but is finally finished! Many of the Park staff were also called into duty when Shasta State Historic Park was caught in the center of the Carr fire. That Park lost a 1920s schoolhouse, and damage to the brewery and cemetery. Thanks to rapid work by staff from surrounding areas, including our own, the important museum collections were secured and removed to safety. We are pleased to announce that thanks to a volunteer camp host, Ed Adams, the “Night Sky” presentation, with large telescopes for viewing the stars has been renewed and brought up to speed. At a test run in early August, Ed’s passion for the subject was palpable and infectious. We stayed for two hours, learning many things about the planets, stars, constellations, moon, history, and meteor showers. Unfortunately, the smoke has limited the program this summer. Ed is currently planning to return next year, so we are hopeful that with the return of clear skies we can look at those galaxies far, far away soon. We are beginning to gear up for Heritage Day, Sunday, October 7. Make your plans to join us, including camping and cabin reservations, for good music and good fun. When my daughter Hana Lyn, who is visiting from Maryland, found out that there is a lady in Burney who sells Mary Kay, she was so happy. She had run out of foundation. So Linda messaged Bobbi Frazier and we arranged to meet at 11 a.m. on Tuesday at the Word of Live Assembly of God (WOLA) for resupply. When we arrived, the WOLA coffee shop and lobby were buzzing with activity. Bobbi was there and so also were two members of a 4K for Cancer Team running from San Francisco to New York. So while Hana Lyn transacted with Bobbik and got a latte, I spoke briefly with one of the team leaders for the 4K Run, Cheyenne Greenside. Kathy Newton who was organizing hospitality for the runners during their rest stop in Burney, told me that they would be having a barbecue at WOLA that evening and invited me to come take pictures for an article. (See 4K Runners Grateful for Burney Hospitality). 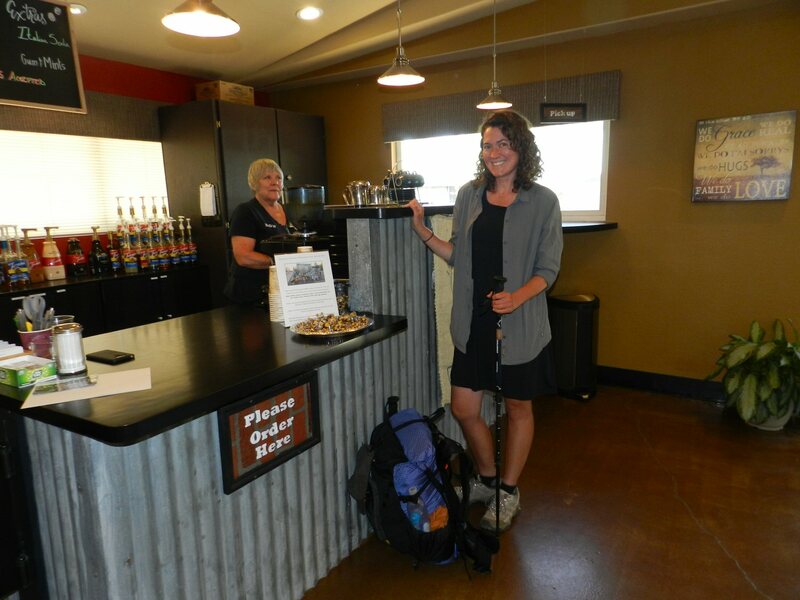 In the meantime, I noticed several PCT hikers in the coffee shop. Five more hikers were enjoying the hospitality of WOLA. Two of them were heading back to the trail that day and three of them were planning to rest, resupply, and stay for the night. I managed to chat with the two who were planning to trek on that day. Rebekah Archer is a charming, thoughtful young lady from Melbourne Australia who is flip-flopping (skip-hiking) the trail. Her trail name is Weaver. She began solo hiking in Campo on April 9. As she hiked through the Southern California desert she made several friends with whom she hiked. Rebekah said she saw a lot of rattlesnakes in the south. 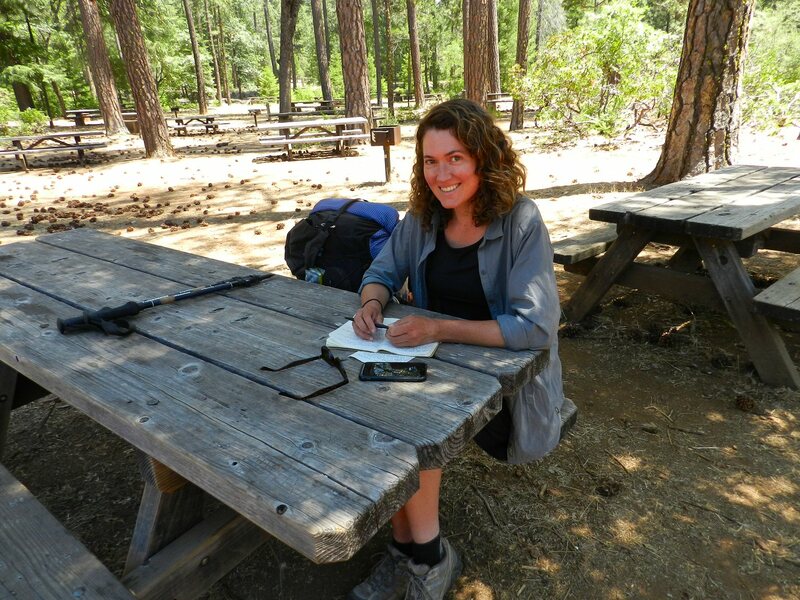 When they reached Lone Pine (Mile 788.8), she chose to skip the Sierras and hike north from Chester. Hiking from Chester to Burney she has seen a lot of deer but no bear yet. I told her she may well see one in this area. After she passes through the Northern Cascades to Canada she plans to return and hike south through the high Sierras after the snow has melted. 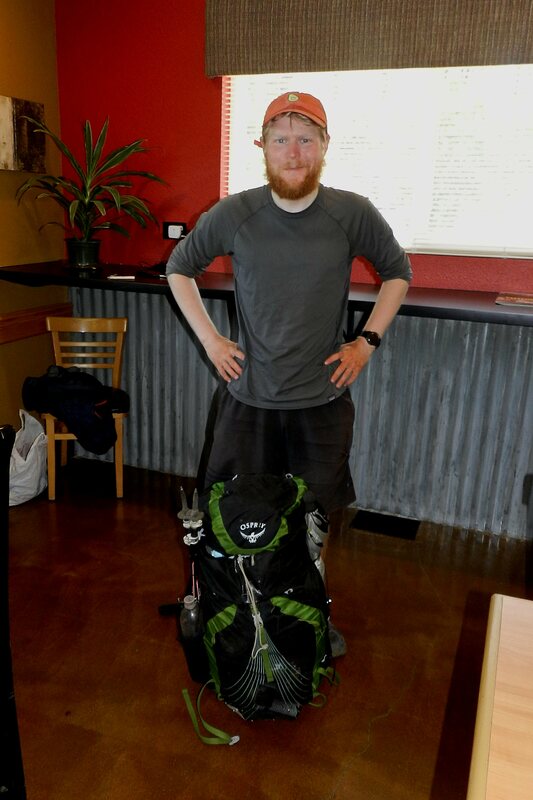 The second PCT hiker I talked with in the coffee shop was a young thru-hiker from Frankfurt Germany. His trail name is Avocado. He started from Campo on March 28. This is the first time that he has done such a long hike. He has hiked the mountains of Europe but never longer than two weeks. Avocado said that what impresses him about the PCT is the “diversity of beauty full of extreme contrast” that he has experienced on his journey through the desert, the High Sierras, the Southern Cascades, Hat Creek Ridge, and then descending into the forests of Burney Basin. He is looking forward to seeing Burney Falls, and then passing through Mt. Shasta, into the forests of Oregon and the Northern Cascades in Washington. Just before leaving Germany for his adventure, Avocado completed his undergraduate degree in sociology from Frankfurt University. As he is walking north through the wilderness, he is pondering whether he should continue his studies or begin his career. From the point of view of a sociologist, Avocado said that the PCT culture is a “tiny special society.” It is international. There are people of all ages and backgrounds making the journey for varied reasons. There are day hikers, section hikers, through hikers, and hip hoppers. Trail angels support and encourage the hikers and businesses in small rural towns cater to their needs. Rugged outdoor adventure interfaces with hi-tech social media and special PCT apps to facilitate the journey. There is a fluid blending of individualism and group formation that enriches the PCT family. Avacado said that he may write a short paper on it in the future. He said that he met only one person hiking through the snow in the Sierras without a cell phone. Avocado considers his phone to be not just a means of communication but a safety device insuring location and rescue in case of mishap in a treacherous area. After talking with Avocado, Hana Lyn, my wife Linda, and I headed to Burney Falls to hike the Loop. While there, we ran into Weaver again, sitting at a picnic table writing in her journal. She was planning to have an ice cream before visiting the falls and heading north. 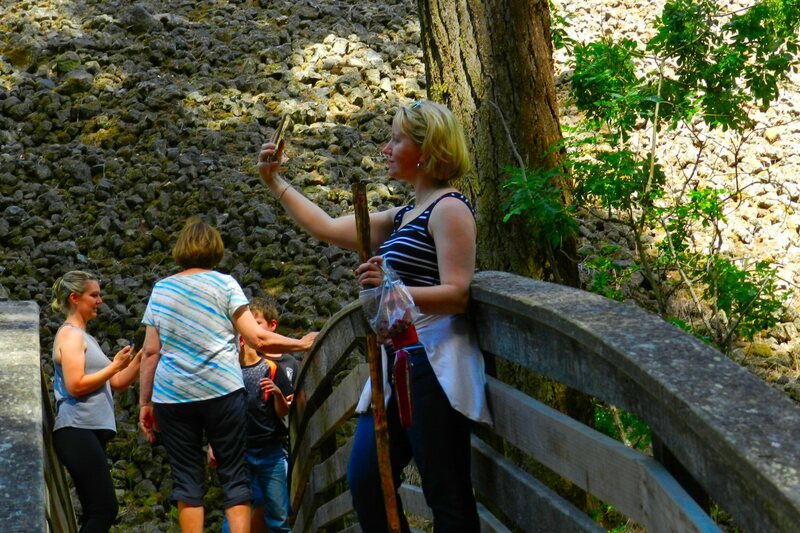 Hana Lyn, with her new Mary Kay foundation, had several opportunities to snap selfies by the falls and on the bridge over Burney Creek. Ah! The best of all worlds! 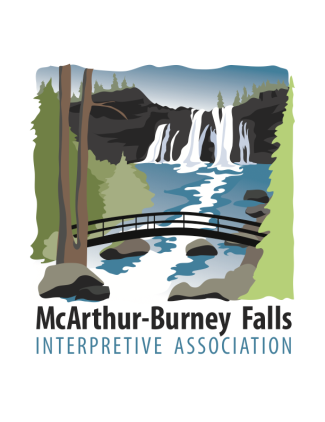 McArthur Burney Falls State Park opens the 2018 season on May 11! Of course, the Park is open year round, and welcomes visitors at any time. But the full staffing, including Visitor Center and the Store open typically this time of year. We hope your plans include a visit this year! The remarkably wet spring we have had ensures that the falls are roaring and beautiful. The spring flowers are blooming and the birds are beginning to be heard. The black swifts haven’t yet returned, but they will be flitting in and around the falls soon. This pre-Memorial Day period is an especially lovely time to come, as the crowds are less! All the trails are open, except for the Lake Trail and the PSEA Trail. Both closures begin at the Rainbow Footbridge and continue north to Lake Britton. The very wet 2016-17 winter destabilized the land supporting the trail, and extensive rerouting is planned but not yet completed. The Falls Loop Trail, the Headwaters Trail and the Cemetery Trail are all open and inviting. The Friends of Burney Falls and Castle Crags State Parks has completed our 2017 Annual Report. 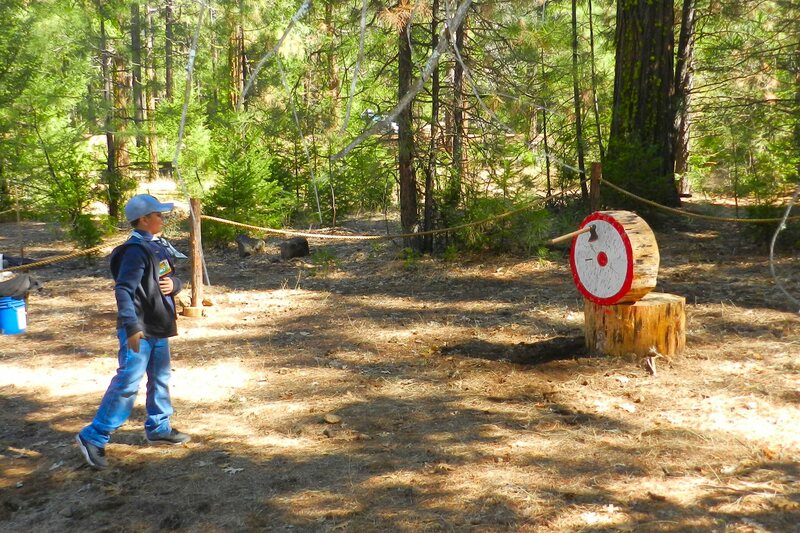 We include specifics about interpretative activities in both parks. 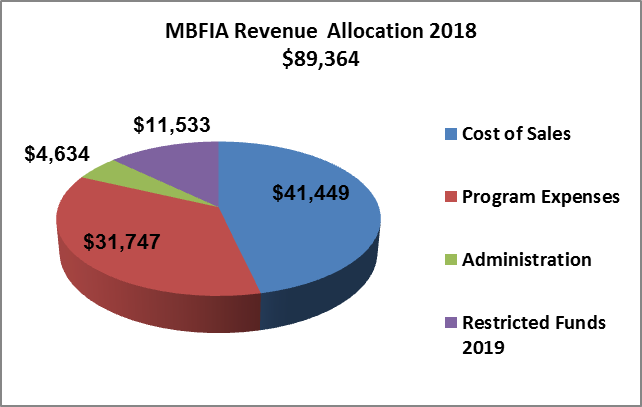 We also report on how we spent the revenue we receive from recycling, the sale of firewood and from sales in the Visitor Center, as well as donations. If you would like a copy, reply to this e-mail and we’ll send it to you by mail or on line. 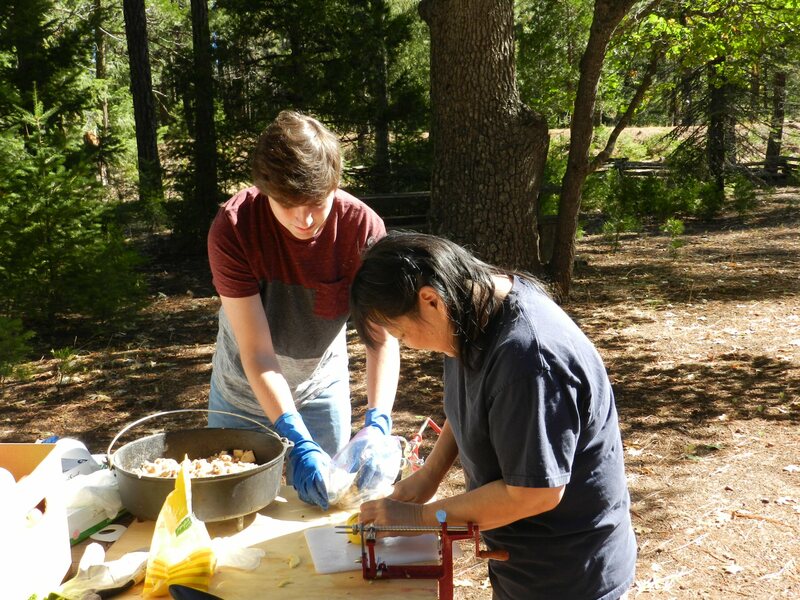 The California State Park system is transitioning to a new reservation system for camp sites. It is now ReserveCalifornia, and the transition has been a little bumpy for some. If you have difficulty making a reservation, call their number at 1-800-444-7275. The on site camp staff do not make reservations after the start of the season. 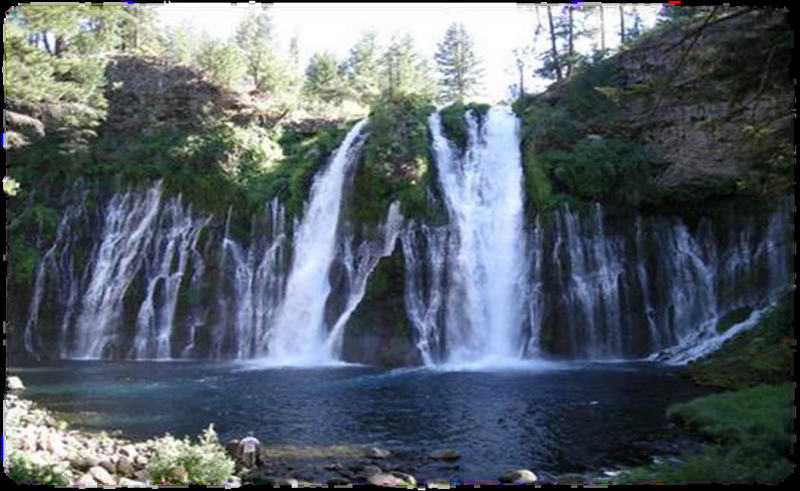 Friends of Burney Falls is not a political organization. However, we have endorsed Proposition 68 on the June ballot in California. Proposition 68 would authorize $4.1 billion in bonds for park and water projects. Notably for us, it would provide desperately needed funds for deferred maintenance in parks like ours. We encourage those of you in California to look carefully at this proposition.